Do you know the difference between following up vs. chasing clients? For those who answered, “Not sure,” you’re not alone. This is one of the questions frequently asked when talking about sales. People struggle with when and how many times they should follow up with prospects and clients. About a year ago I published an article, Why Chasing Clients Doesn’t Work explaining what happens when you chase after people. It’s important to distinguish, there is a difference between following up with clients and chasing clients. Just as we all need to breathe, we should also all be following up with prospects/clients. The question for most people isn’t if they should follow up, it’s when and how many times. “Sharing a follow-up win! I spoke with a group back in July and had someone want to schedule a strategy session with me. The first email I sent her she said: “not now check back in a month or so”. Sent the second email a few months later she said: “not now check back in a month or so”. Sent the third email and she scheduled a session for today and signed up for my VIP program and is an ideal client for me!! Ask yourself, would you have followed up this many times after the first or second response? Most people wouldn’t. Frankly, the majority of people wouldn’t have even made it to the second follow up. Years ago in a class about sales and marketing, the instructor shared that over 70% of all leads from trade shows never get followed up on. My guess is that’s probably a consistent statistic regardless of where the lead comes from. Following up with prospects is probably one of the hardest parts of the selling process. It’s certainly the one thing that gives many of my clients anxiety. Let’s talk about when you should follow up with prospects. The most simple answer is: when you tell them you’re going to follow up. For those of you who’ve followed my work for awhile, you know I advise scheduling your next time to connect with clients before you leave the last interaction. This takes all of the guesswork out as well as the anxiety about following up. You and your prospect have a time and date set on your calendar so of course, you’re going to reach out to them. They are expecting your call. Quick check in as I thought we were scheduled to chat today at 10:30 am. Did I get the time wrong? If not, is everything ok with you? Please let me know all is well. Let’s go ahead and schedule another time that works for you. Here are a few options. Would one of these work in your schedule? There’s a good chance you’ll receive a response to a message like this. Meetings get missed for a variety of reasons. Don’t assume the worst and decide the person blew you off on purpose. Give them the benefit of the doubt and offer to reschedule. 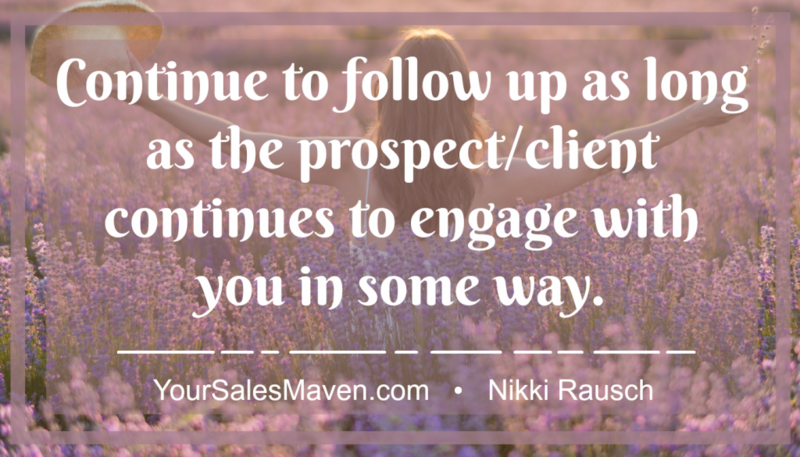 My rule of thumb about following up is to continue to follow up as long as the prospect/client continues to engage in some way. Like my client above, her prospect responded each time she reached out to her. She let her know she wasn’t ready yet and that she’d like to hear back from her in a few months. That is client engagement and in those instances, I encourage you to put a time and date on your calendar to follow up. It’s essentially a client saying, “Not yet” to buying. There’s still a chance. When a client stops returning emails and/or phone calls and you continue to follow up, you’ve moved into chasing mode. It’s been my experience that chasing clients rarely pays off. At some point, you’ve got to decide what else you could be spending your time and energy on to generate revenue. Of course, you need to decide what works best for you in your business. People who continue to follow up with me when I’ve never engaged with them or when I’ve told them no irritate me. It’s a huge rapport breaker. Remember prospects/clients don’t owe you a response and/or their business. It’s your job to earn their response and their business. Consider taking a few minutes to investigate how many times you followed up with your last 5 to 10 idea clients who ended up hiring you. Did those clients stay engaged the whole time or did they fall off the face of the earth during the “courting” phase? Paying attention to these details may give you some insight into what’s actually working in your business. And more importantly, what you should continue to do going forward regarding follow up. After reading this article, what will your follow up routine be going forward? Will you be making any changes or staying the course?